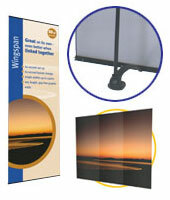 CLS Displays : Market leading display solutions. 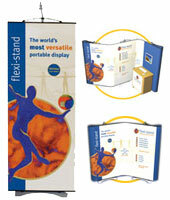 Exhibition stands, portable display systems. Banner stands, pop-up displays, modular display systems, large-format printing. flexible linking displays, pop-up displays, modular stands, portable furniture and literature racks. start saving from your first order. Great on its on - even better linked together, the Wingspan offers cost-effective solutions for creating gap-free graphic walls. Add £3o per link. Big impact - no effort. 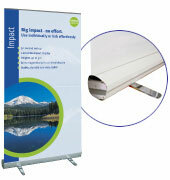 This superb quality 120cm wide roller banner offers height options up to 3m tall and takes just 1 min to erect. Use individually or link effortlessly to create big impact displays. The new FlexeStand is the world’s most versatile and flexible portable display. It can be anything you want it to be from a simple banner stand to a large modular exhibition display with multi-media screens. Brilliantly designed, the FlexeStand is simple to use yet amazingly versatile. Essentially it comprises banner stands that can be used separately or can link and flex together to create almost any size and shape of display.